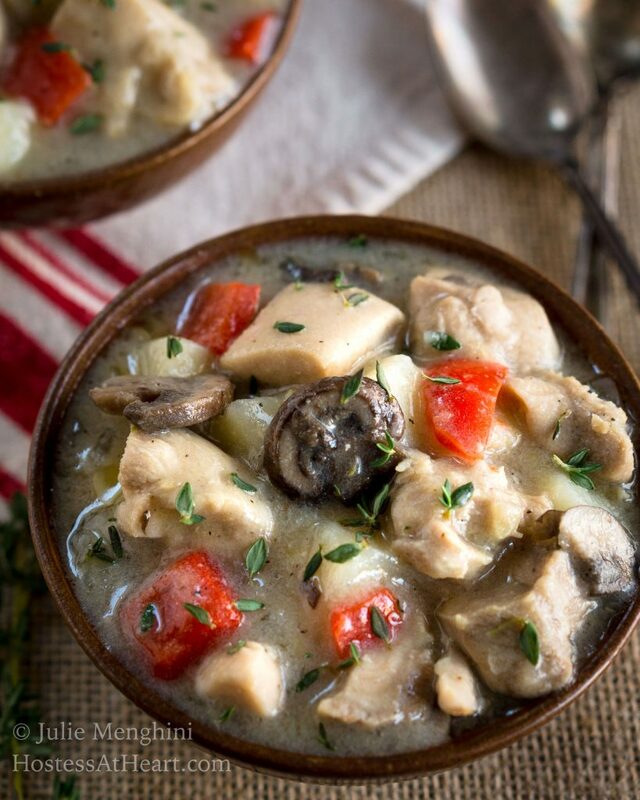 Easy Creamy Chicken Stew with Potatoes recipe is like a big ole hug from the inside out. It’s comfort food without the extra fat and calories. Boy is it cold outside which means we are craving comfort food. 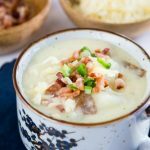 Comfort food like this Easy Creamy Chicken Stew with Potatoes Recipe that can be made in a jiffy! 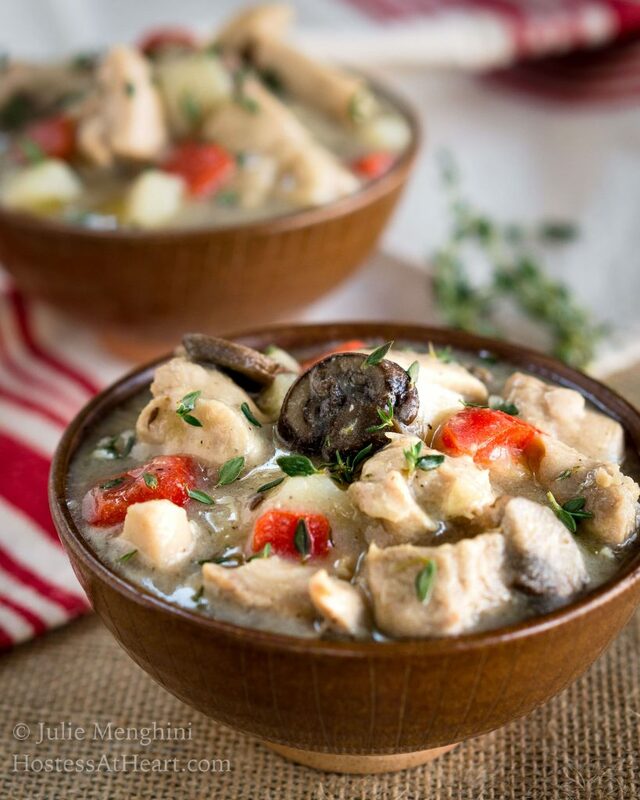 When my kids were younger we made a lot of dishes like this Creamy Chicken Stew with Potatoes. They fondly called these dishes “Sip” which stood for “Sh*t in a pot”. It described a lot of my recipes from that time. 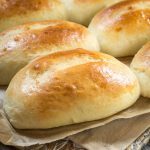 No recipe and just using ingredients that I had on hand. Those dishes were one of the reasons why I started my blog. My daughter would ask how I’d made a certain dish that she’d grown up eating. When I told her I just thrown this and that in a pan she got a little exasperated and asked why in the heck didn’t I write these recipes down? How in the heck was she supposed to make it? I had a similar experience with food that I fondly remember eating at my grandma Nanas house. I never saw her use a recipe but I sure wish I had her sugar cookie recipe. She’d roll them out and I’d cut them out with a large round cookie cutter. Her recipe is long gone but several of mine are sitting on this blog or still to come. 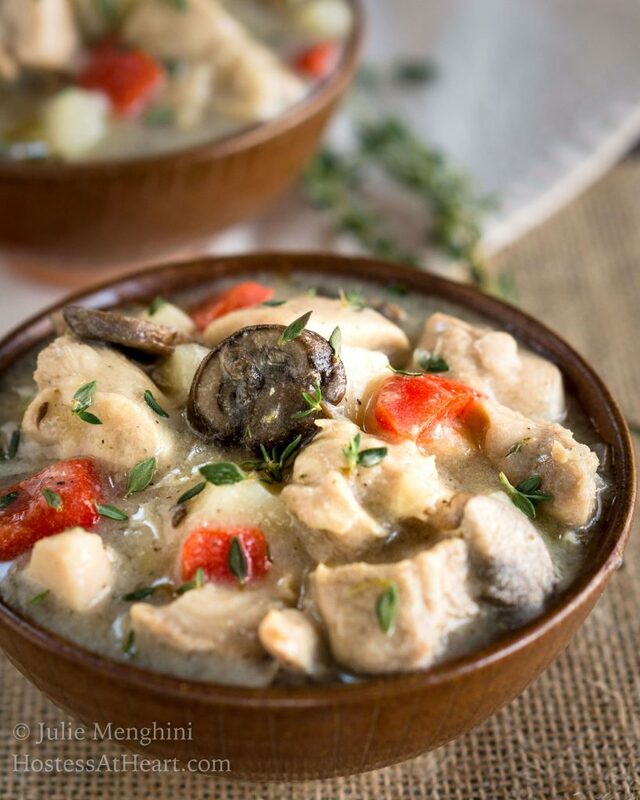 This Creamy Chicken Stew with Potatoes recipe is one of those recipes that was in my head and just came together. It turned out so good and perfect for so many reasons! It’s quick and easy to put together in one pot. 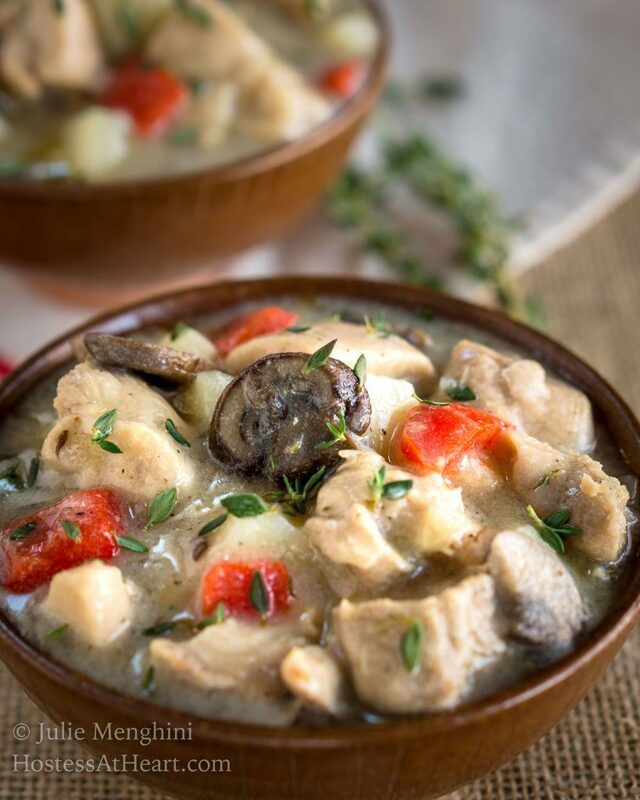 Easy Creamy Chicken Stew with Potatoes Recipe is like a big ole hug from the inside out. It's comfort food without the extra fat and calories. In a large stock pot (6 qt) melt butter and add potatoes and onions. Cook until they begin to soften (not browned). Add chicken, mushrooms, and red peppers. Stir to combine. Add flour and stir to coat. Pour in chicken stock, fresh thyme, salt, and pepper. Cook until chicken is cooked through and potatoes are tender. Not mushy! Add additional salt and pepper to taste. Serve in bowls and garnish with additional fresh thyme if desired. You could definitely add the veggies of your choice but I didn’t go crazy for a reason. I wanted this dish quick and simple and of course, delicious! I hope you enjoy your own version of “SIP”. 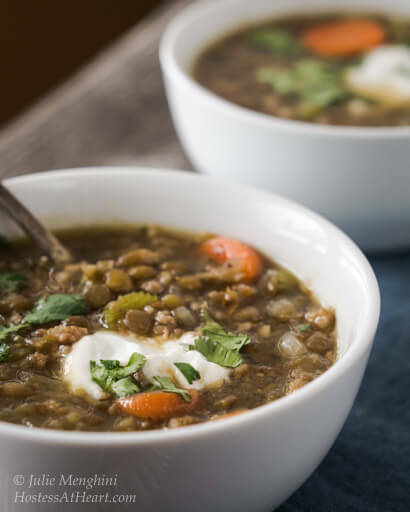 Baby, every day is soup season in our house and here are some more of our favorites! That looks like a piping hot bowl of comfort right there! Thank you so much, Michaela! I could eat soup every day! 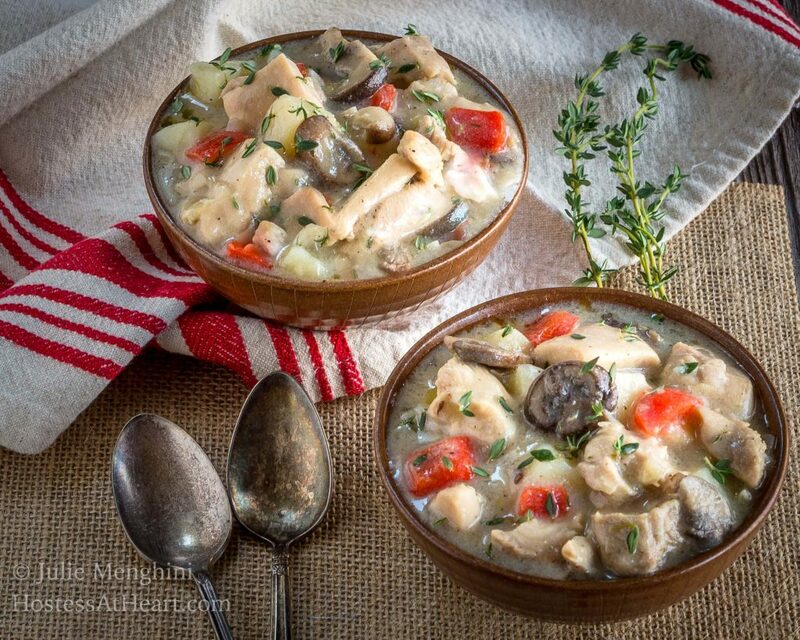 Your photos of this wonderfully creamy chicken stew are almost 3-dimenstional. I don’t think it could look any better and I can only imagine how great it tastes. 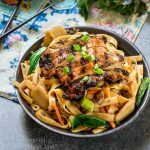 Beautiful job with this recipe, Julie! Thank you so much, Dan! It’s definitely soup season here! 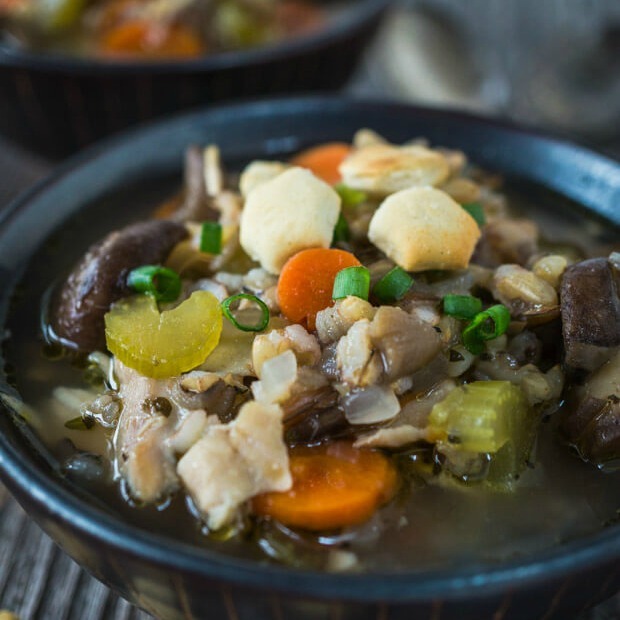 Wow, this chicken stew recipe looks yummy!Perfect for the dinner. I will try at home. Thanks Julie for sharing! Ha! Love your sense of humor 😀 What a lovely recipe and I’m sure your daughter’s loving it too, truly looks like the perfect bowl of stew! Using chicken thighs is smart too, they impart so much flavor, yum!!! Thank you, Debra! It helped get my kids to eat dishes that they thought it was like legal cussing LOL. When you are used to just throwing ingredients in a pan it’s hard to give specific directions. So glad you took the time to share the details for this stew recipe. It looks delicious! Thank you so much, Sandra! I now keep my notebook in the kitchen and it’s hard not writing it down when I know it’s not going to hit the blog LOL! Chicken and mushrooms is one of my forever favorite flavor combinations. This looks perfectly cozy and like an ideal way to enjoy this killer combo! Thank you so much! I’m with you, I love the combination and that this was so easy to throw together! Recipes with everyday ingredients are my favorite! And this one looks so perfect for January. 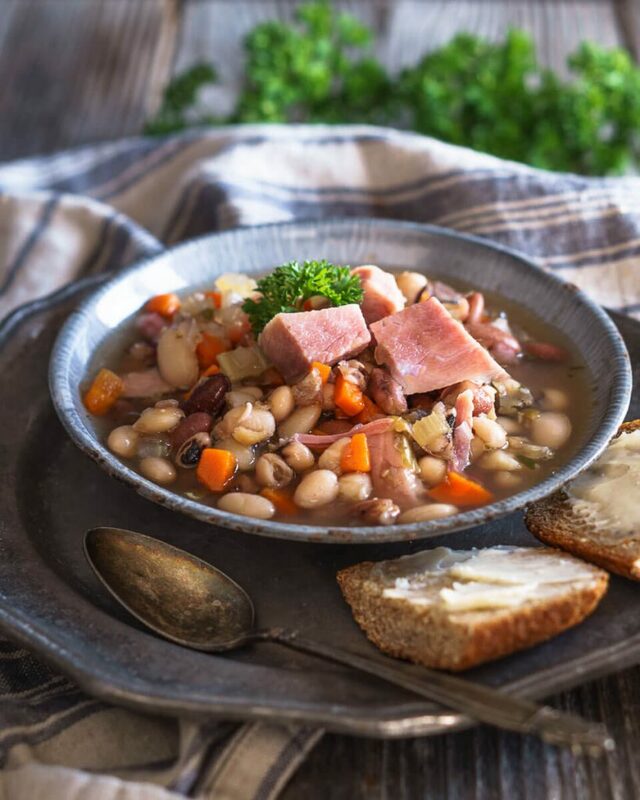 Holidays are over and we can use a warm cozy soup on a chilly night. Thanks for sharing! Thank you, Paul! We are definitely on the same page. I’m loving the comforting bowl of warmth and delicious. Definitely putting this on the menu for dinner. This looks like such a cozy and warming dinner for January. I’ll have to tell my mom about SIP dishes–many of the dinners she made us growing up were exactly that because with four kids she didn’t have time for grocery shopping often :). Thanks, Kelsie! My kids loved SIP because it was like legal cussing. I already feel all warm and fuzzy inside just thinking about eating this. Looks perfect for these bitterly cold winter nights! Thank you so much, Karly! We are definitely in the soup mode! 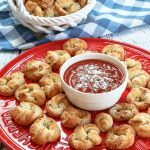 This is exactly the kind of comfort food I need right now, since we’re in the deep freeze here in Minnesota! Thank you Lisa! I hear you on the cold. Crazy here too but we may get above freezing next week! Woo hoo! I’m not tough enough to live in Minnesota. Hey Julie! I love potatoes in soups. This looks delicious! Thank you Debbie! Especially if they’re not over cooked! Hysterical! Sip recipes! I think all good cooks do this because they know flavors and textures, and aren’t wasteful! Thanks, Mimi! It was so funny in the day and my children just loved saying it and were more apt to eat it too!